Antiques quiz show hosted by Fern Britton. Antiques expert Charlie Ross assists Fern as the three teams compete for the prize. with questions and asks you if you know the value of your vintage. is to amass the most valuable collection. Now, some antiques are old and some antiques are gold. -Lovely to be here, Fern. Tell us about some of the lots that we've got here. Well, what have we got today? We've got some fascinating objects. Mm, what a great mixture. which is worth a tenner or less. That is the lot to avoid, teams. Let's meet them. Team one, who are you? I'm Pat, and this is my friend, Eve. We met at a church about four years ago. We both preach in the church as well. -Welcome, ladies, and good luck today. I'm Gary. This is my wife, Silvana. on board oil tankers sailing around the world. Wow. Look forward to hearing more about that later. And, team three, who are you? This is Jim, and I'm Charlie. And we met through our love of antiques. Very nice. Well, good luck. watched over by our expert, Charlie. But could they separate the posh from the tosh? Oh, Gary, look. My favourite, a chair. Lovely things to look at. It's a silver wedding, it says. So we assume it's silver. -the fact that it's plate. Why are they looking at the back of it? There's the hallmark across the top. -It's hallmarked across the top. -Oh, that's a bit sneaky. -It's well worn on these arms. -But I love the legs. -And we have a house full of them. So have most houses! Otherwise you'd have to sit on the floor. Sindy. Got an attic full of these. Toys are very much in the offing now. And the box is perfect. That could be the one. Showing a bit of knowledge here, girls. Now, I've got quite a few paperweights. It's a pretty standard piece. -Blue and white. It is. -It's a willow pattern picture. -It's got the bridge with the little people on it. Would you say that's Japanese or Chinese? Don't hit it too hard, you'll break it! -Well, there's no milk in it, for sure. I don't think there's much you can say about a milk churn, really. -It's a very old milk churn. -It is a very old one, yeah. I'm sorry, but that piggy does absolutely nothing for me. -Kinsella. Now, that's a name I've heard before. You're not good on hallmarks, are you, guys? -If he's got a hallmark, he's silver. He is heavy. Yeah. He's not junk by any means. First edition. That could be valuable. Do you know, I think that's a red herring. Charles Dickens is described as a red herring. -This is your area, Charlie. I don't think they're diamonds. But they might be paste as well. Both my aunties had them in their homes. This has seen a few hot cross buns. -You think Sindy is the top? The diary and the pig. I think the pig might be worth quite a lot. And I think the bottom lot will be the milk churn. So, we're putting the cup at the bottom. The bottom lot, I want to choose the cross. is not worth a lot more than we think it is. Charlie, how has the valuation on these lots been reached? Now, it could be worth thousands or it could be worth peanuts. But that is for our winners to decide a little bit later. of the next question. So, pickers, please make your first pick. Eve and Pat have gone for the sculpture. Gary and Silvana have gone for the dish. But Charlie and Jim have gone for the sculpture too. So, quizzers, figures on buzzers. Question number one. In The Wombles, the great uncle is named after which country? It is Bulgaria. The sculpture is yours. Eve and Pat, you've chosen the book. Gary and Silvana, you've gone for the dish again. Charlie and Jim have gone for the diary. what is the second most abundant gas in the air we breathe? Well done. The diary is yours. Eve and Pat are sticking with the book. Gary and Silvana have gone for the doll. And Charlie and Jim have gone for the pendant. as the Divine Miss M? Eve and Pat are going for the dish. Gary and Silvana are going for the dish. Charlie and Jim are going for the book. In which British port city was Charles Dickens born? He did live there, but he was born in Portsmouth. Eve and Pat, you're frozen out of the next question. Silvana and Jim, please make your pick. It's a battle for the doll. In ballet, a pas de deux is a dance for how many people? Correct. Well done, the doll is yours. Eve and Pat, you're back in. Eve and Pat have gone for the book. Gary and Silvana, the dish. Charlie and Jim, the watch stand. The question is, who was the first Norman king of England? Yes! You're good at this. OK. The watch stand is yours. We've got two more questions on this round. Pickers, make a pick. Eve and Pat have chosen the book. Gary and Silvana, the chair. Charlie and Jim, the dish. Eve and Pat, you really want that book, don't you? shares its name with a now-defunct newspaper? The answer is the News Of The World. OK, this is the final pick and final question. Charlie and Jim, the chair. red, yellow and which other primary colour? You said blue. It's correct. -The book is finally yours. Let's have a look at the end of round one. We have Eve and Pat with the book. but you've got plenty of time. the watch stand and the diary. in someone else's collection, or still on the grid. Eve and Pat, you're up first, and let's find out more about you. So Eve, you say you're a church preacher. -But is that the same as being an ordained vicar? and various people, laypeople, will preach in the church. And Pat, you're a preacher too? and I try to keep all the little village chapels open. I once did a whole sermon in character as Nicodemus. OK, which lot would you like to know more about from Charlie? I would like to know more about the sculpture, please. an English artist specialising in animalia. is a highly collectable item. than its weight in silver? Hmm. I can see there's quite a lot of chin-rubbing there. Charlie's looking at that with enormous interest. Mind you, it is in his collection. Thank you very much indeed, Eve and Pat. Now, Gary and Silvana, lovely to meet you. Gary, I understand you were at sea on and off for years? and then at sea till '86. Silvana, I understand YOU went to sea on and off for several years? I certainly did. For my sins! What would you like to know more about from Charlie? I would like to know more about the dish. It is an Art Nouveau dish. Classically stylised by intricate linear designs and flowing curves. It's made from Britannia silver, which is an alloy of silver. Britannia silver is a finer metal than sterling silver. It's in good condition with no visible damage. it may not be to everybody's taste. but in terms of its value, is it a case of bold is beautiful? while we meet team three. Charlie and Jim, welcome, gentleman. Charlie, you work for a charity called Wings for Warriors? -how to take up a new career in commercial aviation. -How did you get together as a team? I happened to say to him, "I know a little bit about antiques. "A very little bit. If you can't find anybody, I'll accompany you." We've become very good friends in that short time. I'd like to know more about the diary, please. who lost his leg in the Somme. It's a wonderful, sentimental piece. But how much is it worth? I don't think a huge amount. Charlie, thank you very much indeed. and that you are now ready to play round two. so choose wisely. Team one, you're up first. Pat, tell me, what's your lot? I would like to choose the stove, please. how are you on either Civil Rights or Festivals And Holidays? Erm, I think I'll go for Festivals And Holidays. also known as the Festival of Lights? and the stove is yours. Silvana, what would you like? I'd like to select the dish, please. The dish. Civil Rights or Flags Of The World, Gary? We'll try Flags Of The World. Flags Of The World. Here's your question. How many stars are depicted on the flag of Australia? Unlucky, sorry. The dish is not yours. Charlie and Jim. Jim, please pick a lot. OK. Charlie, Plays or The Beatles? OK. Now, we're going to hot things up a bit. Teams, have you missed out on that one item that you really wanted? or you can try to steal a lot that is in a rival team's collection. Eve and Pat, do you want to pick or do you want to steal from a rival? I would like to go for the sculpture again, please, and steal that one. Eve would have most difficulty with? My husband is an avid follower of rugby union. -I'd better get it right! are different types of what playing position? Right, so Eve is not to be underestimated, boys. Gary and Silvana, pick or steal? I'd like to steal the doll. find a category that you think Gary will have difficulty answering. All right, Gary, here we go. was approved by Parliament in which year? The doll stays firmly with Charlie and Jim. And it's Jim's turn now - pick or steal? Can we steal the sculpture back? Eve and Pat, what category is going to baffle Charlie? Yeah, go on. Let's try with that and go with Silent Films. was born in which country? but for you, the sculpture doesn't come home. It stays with Eve and Pat. Do you want to pick from the grid, team one, or steal? Erm, I think I would like to pick the paperweight, please. Eve, Civil Rights or The Beatles? I'll try The Beatles. It's my era. when he was just 14 years old? Gary and Silvana, would you like to pick or steal? And I'd like to steal the doll. what category would you like to give Gary? replaced his surname with which letter of the alphabet? All that for a doll. Yes, all that for a doll, but she's yours. Here she comes. Right. Charlie and Jim, pick or steal? Eve and Pat, what category do you want to give Charlie? Try Plays. It could be anything, couldn't it? Charlie, how are you on plays in the theatre? Aye, all the world's a stage. I like it. OK, here we go. is set during the Salem witch trials? The sculpture is coming back to you. Ooh. The girls are waving it goodbye. how the collections are looking. Eve and Pat have the book and the stove. Gary and Silvana have the doll. the sculpture and the watch stand. OK, for one team, it is now sadly the end of the road. with the least valuable collection will now be eliminated. So, Charlie, who are we saying goodbye to first? So, Gary and Silvana, we will miss you. is also leaving the game, and it is, of course, the Sindy doll. But you want to find out how much that's worth, don't you? This is a lovely, lively Sindy doll from 1973. Sindy is a British fashion doll, a rival to Barbie. including your good self, I believe, Fern. I do love a Sindy doll. Yes. And naturally, mint condition dolls are the most sought after. which suggests she's never been played with. And the charm bracelet is still included. So she's pretty, but is she worth a pretty penny? We're not looking at something that is earth-shatteringly valuable here. So, Gary and Silvana, thank you for playing For What It's Worth. -Thank you for having us. -Well, we'll find out, Fern, won't we? when the first cylindrical types were introduced. they have since become an iconic design in their own modest way. I'm not surprised that this churn went past-your-eyes. Here we have a Victorian wingback armchair. It has a typically low seat, cabriole-style armrests and legs. these chairs were a symbol of wealth and comfort. But does this still ring true today? so you haven't missed anything enormous. It's a medium paperweight by the French glass-maker Baccarat. This paperweight has a millefiori design. and came up with the millefiori word, didn't you? Well done. Charlie, you've got several of these at home, have you? Yes, but I don't think they go back that far. They're more modern ones, are they? and you've passed by £800. of Staffordshire blue and white transfer printed earthenware. from the copious cracking and yellowing of the porcelain. It was made certainly no earlier than 1820.
and the sheer quantity of objects that it adorns. And value - well, let's cut to the chase. This is worth the best part of nothing. Now, we have one more item left, don't we? And that's this magnificent dish. We talked about it already. It is from the Art Nouveau period of the late 19th century. because it was right up on the top. than the front of it. It was made by Aldwinckle and Slater. and it's a fabulous item, and it's still there. And I rather wished it had been here. Because it is worth £2,500. But it's gone. It was missed. Right, teams, congratulations on getting this far. -I'd like to know about the watch stand, please. designed in the Gothic Revival style, circa 1880. Pocket watch stands were commonplace at the time. They served a simple yet practical purpose. you've got yourself a bedside or desktop clock. That's for you to think about. Charlie and Jim, what would you like to know more about? was regarded as one of the greatest novelists of the Victorian era. and addressed "Mr Hicks, Mrs Bradbury and Evans." a foreman printer, and is mentioned in Dickens' correspondence. as it has some fading to the spine and edges. Nine of the answers will be correct, three are not. both quizzers and pickers will play, so there's nowhere to hide. to steal a lot from your collection. can choose to go first or second on this one. So, Charlie, who is that at the moment? who played themselves on the show? who have specifically provided their voice, not their likeness. Nine of those names will be correct answers, three of them are wrong. Charlie, give me an answer. And it's wrong. He never did. Let's have a look at what the other answers are. neither of whom have lent their voice to the Simpsons. Well, Eve and Pat, what are you going to steal from Charlie and Jim? please could I have my piggy sculpture back? He really is piggy in the middle, isn't he? Piggy sculpture, go. Back to Eve and Pat. Now, then, Eve and Pat, this is your question. You need to find the moons of the planets in our solar system. Eve, give me an answer. Yes, that's the moon of Saturn. It's correct. It's a moon of Jupiter. -Oh, incorrect. It's a quartz-like stone. -A yellowy colour, I think, mostly. I thought it might be a moon as well! Oh, well, it's not a moon as well, sadly. she was in The Hunchback Of Notre-Dame. So Charlie and Jim, what are you going to steal from Eve and Pat? -Gosh, that's a hard one. -That's a really hard one. -Yeah. It has to be the sculpture. It has to be the sculpture. This pig's grown wings. And he's back in your collection. Team three, Charlie and Jim, here is the question. British Unesco World Heritage Sites. to be of outstanding value to humanity. which are currently covered by Unesco listings. So, Charlie and Jim, would you like to go first or second? We'll go first, Fern, thank you. It's all on this question. Final question. You're going first. Yes. East Devon and Dorset coastline, of course. Sadly not. Let's have a look at the other wrong answers. Victoria and Albert Museum and Windsor Castle. Eve and Pat, would you like to steal? -You know they say pigs might fly? -Could our pig fly, please? Go on, piggy, go back to Eve and Pat. -This is the most hotly contested pig in history. Charlie, who are today's winners? Our commiserations, though, to Charlie and Jim. how much the collection you have is worth. Well, the watch stand is there, isn't it? but I suspect that this is getting on towards 1900. The Gothic Revival, one thinks of Ruskin, Pugin, William Burges. This is not without value. There was a lot of chat with your diamond pendant. It's a bit of a mysterious piece. that were inspired by Queen Victoria herself. as to whether they were diamonds or whether they weren't. Yes, they are. They're not the finest diamonds. They're not the largest diamonds. perhaps you might think surprisingly low, but £300. The final object is that remarkable diary. which shows some wear and scuffing, not surprising. and the slight loss to the spine. and it's not without value, certainly. £600 would be the auction value of this item. So what's the total value of Charlie and Jim's collection? The total value is £1,020. -Not a bad sum at all. So, well done, Eve and Pat. Oh, good grief. Shall we stick with our flying pig? though the book's not in good condition. No. Oh, let's stick... Shall we stick with the pig? -Oh, let's stick with the pig. -I'm happy with the pig. -We will stick with our pig. -We like our pig. We're going to stick with it. Great. Sticking with the pig. I think you should, after all of that anyway, don't you? OK. We're going to stick with the pig. Charlie, can you please tell us what Eve and Pat have not won? I certainly can. They aren't taking home a stove. Probably just as well, really, cos you wouldn't be able to pick it up. This is a cast-iron stove. And isn't that part of its charm? it's at least 100 years old. you have ended up with it. Auntie had one in her home, I think you said, Eve. That's exactly what we both said, I think. I remember being asked to blacklead it when I came for my holidays. Oh, goodness me, they were the days! because this is worth £70. Now, the book. We've talked about the book. First edition with a signature, and a valuable item. we will find out later, won't we, Fern? you have won the value of the pig sculpture. And just out of interest, what do you think it's worth? I would think it's probably worth over 1,000. -Is what I would say, yeah. Yes. Do you agree with that, Eve? but, yeah, I would say around 1,000. Eve and Pat, here you are. Here is your beautiful piggy. that really made you fall in love? Well, I like pigs in the first place. but I wasn't sure because he's a bit shiny. -I thought he was a bit too shiny for an antique, you see. and I thought, there's something about this. It's very heavy, it's very solid. Got a gorgeous expression when you look at him face on. But I think we ought to bring in the third party now. So would you like to reveal the mystery lot? Will I put my temptation hat on? -I don't want to be tempted. -I'm no good at that. -I'm going to tempt you. -Ah. Gosh, that's pretty, isn't it? "Oh, I love you, piggy, I love you, piggy - oh, hang on a minute." How fickle you are, girls. You've forgotten about your pig now, haven't you? Oh, he's beautiful, but they're beautiful, aren't they? -Would you like to know something about it? Silver and enamel tea service. It dates from around the 1920s or '30s. confirming that it is, indeed, proper silver. which are the maker's mark. for the Chinese export market. created purely for decorative purposes. for such non-functional ornamental pieces. This service is in pristine condition. and this could be a very exciting object indeed. is it more exciting than a pig? Well, we'll find out in a minute. is which one to go for. Tell me your immediate thoughts on this tea set. Well, it is so beautiful. It's so unusual and dainty, isn't it? The silver and enamel is lovely. Charlie, what have you done to us? -Because I still love the pig. -I still love the pig. Well, we were saying whatever the mystery object is, we're going to stick with our pig. Whatever it is, we're going to stick with our pig, and then we looked at it, and oh, it's beautiful! -It is beautiful, isn't it? -Oh, I think I'm going to stick with the pig. -We're sticking with the pig. OK. So let's hope that's a lot. please could you tell us what they've thrown away? But, it is 20th century. It's not everybody's cup of tea. Oh, dear. I do apologise. It gets worse, doesn't it? The value of it. Yeah, it's pretty valuable. -Right. We don't know whether piggy will be worth that, but never mind. -OK. The tea set has gone. -Let's focus on the pig that you've been very loyal to. -So, will you please tell us how much this pig is worth? Lucy Kinsella - very much still alive. at Olympia, the Chelsea Arts Fair. does it need to be that old? No, it doesn't, really. and the character - it's absolutely got the character. And what was your valuation? We thought it would be about... I thought about 1,000. I thought it would creep into four figures. Well, I think you and I should swap positions. -Because I think you've won valuer of the year award. with £1,000, or £500 each. Which way are you going to do it? What are you going to do with it? -Split it down the middle. -Oh, yes, absolutely. Split it down the middle. You've been great contestants. Thank you very much. It's lovely to have you here, Charlie. Thank you so much for sharing all your expertise and knowledge. Thank you, girls - you've been absolutely brilliant. And thank you, too, for watching. to spot the lot to win the lot on For What It's Worth. I'll see you next time. Goodbye for now. Bye! 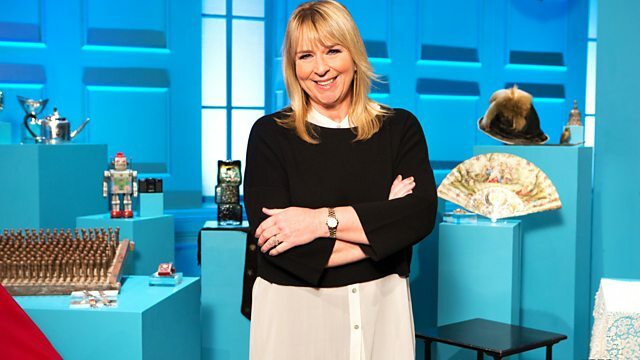 Charlie Ross assists Fern Britton, giving her expert insight into the wonderful world of antiques and collectibles as the three pairs of contestants answer general knowledge questions, hoping for the chance to add antiques to their collections and win the game.